Imagine yourself ... adrift in a four-metre tinnie in the shark-infested waters of the Pacific Ocean - lost and seemingly forgotten - shark bait! Ben Tooki, his uncle and a friend were caught in a storm off the island of Kiribati and swept out to sea. For forty six days they were adrift with little food or water. There's a storm shapin' up; it's been gettin' to full on all day. We hear the rumbling noise. It sounds like the music of a digeridoo, a kind of humming sound. "What's that noise, it's getting louder?" The wave grows into a giant bulge in the ocean. Lifts us like an elevator, and then begins to roll forward, not breaking, but bent on delivering us to some kind of eternity. We're three men, goin' to certain death on the mother of all waves, three men in an elevator, riding a boiling mass of water. It lasts maybe seconds, but it feels like a lifetime, and the tinnie turns in the air, finishing upside down, and me spinning under the sea. 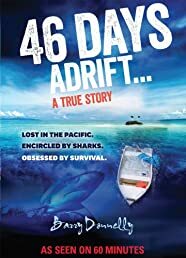 46 Days Adrift is a blow-by-blow account of a time in hell.